Schreibers' Bent-winged bat is a slender medium-sized bat with a characteristic domed forehead. It has a short snout, widely separated triangular ears and grey-brown to dark grey dorsal fur. This species seems to favor hard-wood forest-rich habitats and mainly roosts in colonies in karst caves, mines and cellars with other cave-dwelling species. Fast flight and manoeuvers with its broad tail membrane allow the hunt for moths, beetles, Lepidoptera larvae and even spiders. Schreibers' Bent-winged bats can migrate multiple times a year depending on the weather conditions. The average distance between summer and winter roots can range from 40 to 100km but longer distances have been recorded. According to the IUCN Redlist, population trends vary in different parts of the range. However, due to recent mass mortality events the population appears to be decreasing. 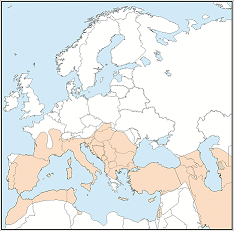 Occurs from south-western Europe and north and west Africa through Anatolia and the Middle East to the Caucasus. In Africa it is known from records in Morocco, Algeria, Tunisia and Libya. Patchily distributed over its range in some large and vulnerable colonies. European populations threatened by habitat loss, pesticide use and loss of roosts. In the northern part of the distribution, a major decrease of the species has been recorded. In the Caucasus, disturbance caused by tourism in caves is a problem.